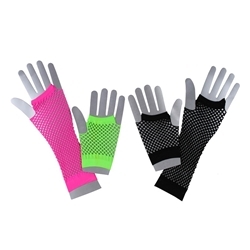 The 80’s Long/Short Fishnet Gloves are a pair of one long and one short Fishnet Gloves as pictured. The gloves come in Adult One Size Fits most, colors received based on availability. Rewind to the 1980’s with these rockin’ gloves! The mismatching length evokes the 80’s mentality of doing whatever you want regardless of what anyone else thinks. Sleeve up these unique gloves for a night on the town, an 80’s theme party, or for Halloween!